This is a sponsored post. March To Get Screened has provided me with two complimentary entries to give away, as well as two for my own use, in exchange for promoting their event in advance and reviewing it upon completion. All opinions are my own. Last year, I had the honor of participating in a very important event: the March to Get Screened 5K Walk/Run. Founded in 2004 by survivor Jan Pratt, the March To Get Screened 5K is an event to raise awareness of colon cancer and the importance of regular screenings for early detection and prevention. Colon cancer is the second leading cause of cancer death in the United States; a routine colonoscopy can prevent colon cancer from even starting. Join us on Sunday, March 29 for a beautiful morning full of inspiration and education. 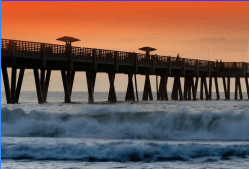 The 5K will start at the Jacksonville Beach Fishing Pier, and follow a gorgeous out-and-back route on the beach. Register online here or at the event starting at 8:00 AM. Registration fees are $25 for runners (timed entries) and $15 for walkers (untimed). Children age 12 and under run for free. After the event, enjoy the March To Get Screened After Party with food and drinks provided by Lynch’s Irish Pub. Darren Corlew will be on hand with live music. You can also enter below to win two free entries to this wonderful event! For more information about March To Get Screened 5K, please visit their webpage, connect with them on Facebook or join the #MTGS Facebook event. Loved this race last year! Great cause! I was just screened for that a couple of weeks ago (it runs in my family) and I’ll have to say it was an entirely unpleasant experience but I’m so glad for the peace of mind!